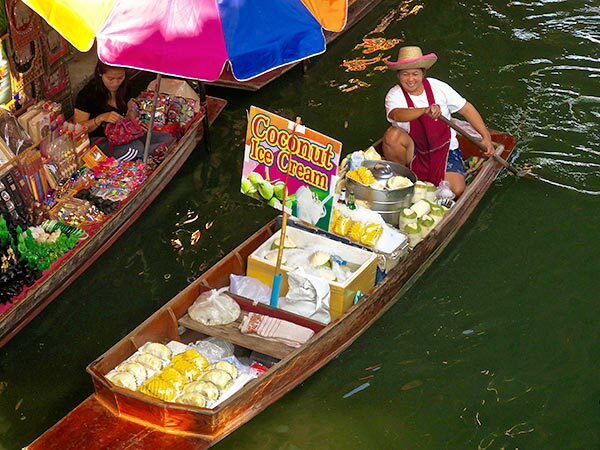 Explore Kasma's information on Thai food & culture. The Food Information page gives a complete overview. Read about a Thai ingredient, from coconuts to fish sauce to turmeric. Learn how to select, prepare and use them. Improve your cooking with the best Thai brands. One student says that just changing the fish sauce to one of Kasma's favorites dramatically improved the taste of his food. Find a market with Thai ingredients, either online, local to San Francisco Bay Area or across the United States. Explore Kasma's Thai cookbooks. It Rains Fishes Legends, Traditions and the Joys of Thai Cooking" (1996) won an IACP award. Learn to cook Thai like a native in Thai.Cooking Classes. Check out information, menus and schedules. Small-group, off-the-beaten path trips to Thailand with Kasma. A wealth of information on Thai food & culture. Blog on Thai Food & Culture. Travel to Thailand, take Thai cooking classes, read about Thai food, Thai travel and Thai culture; learn from Thai native Kasma Loha-unchit as she shares her insider's knowledge, insight and experience. Check out the trips we have planned for Nov. 2019 through Feb. 2020 on our Trip information page. Learn to cook authentic, mouth-watering Thai food like a native, with or without a recipe, in Kasma's classes. These small classes in a home kitchen, features old favorites (such as Green Curry) and new tastes (such as Chilli Curry). "I've taken cooking courses from the Beijing Culinary Academy to the Cordon Bleu in London . . . nothing comes close to the learning experience of your classes!" The articles index contains extensive writings on Thai food & culture. Learn about all things Thai from a native and insider. There's everything from How to Crack a Coconut, How to Care for a Wok and Street Food in Thailand. Choose from the Thai recipe index, where you'll find familiar favorites such as Pad Thai & Basil Chicken as well as less common dishes such as Roti Mataba. Notes and pointers expand, explain and complement the recipes, time-tested by nearly 25 years of teaching. Kasma's will let you create delicious, authentic Thai food. Our Thai Food and Travel Blog will be an ongoing collection of writings and pictures about all things Thai. We'll blog on any- and everything to do with Thai food and Thai travel. Sign up for our RSS feed! Check out our Blog Index or our Wednesday Photo Index. Our Photos Page has links to several photo collections. There are photos from each of Kasma's tours to Thailand, underwater photos, pictures of lively Thai markets and of mouth-watering Thai food. Or check out our blog's Wednesday Photo Index. See also: A Note on Thai Spelling & Pronunciation.